Obtaining used books is vital to any college store’s profitability. Booklog’s Want Listing module helps you to order used books early and often. The system searches the database to determine how many books are needed for the upcoming terms and create a want list for wholesalers. Want lists can be generated manually, automatically based on need, or scheduled for future automatic generation, transmission, and confirmation. 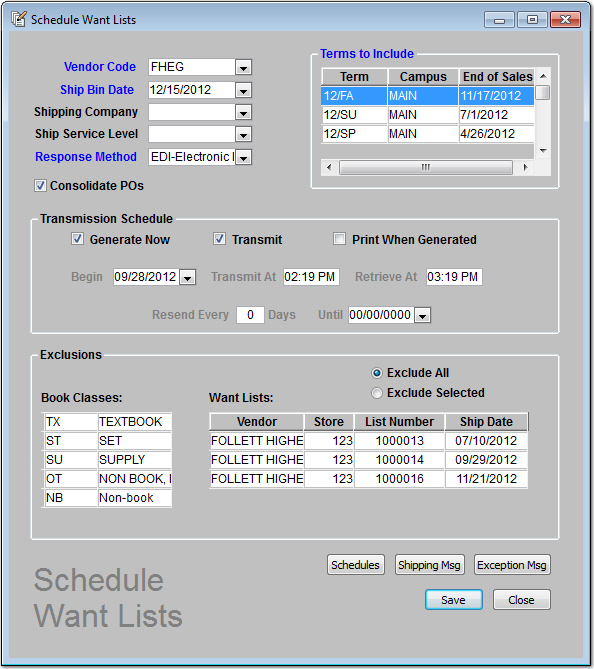 Transmit want lists directly to participating wholesalers such as the Follett Higher Education Group. Electronic confirmations are automatically applied to their corresponding purchase orders, keeping the dynamic need calculations up to date to ensure you order just as much as you need and no more.